With the Rio Olympics, well and truly over us, it’s difficult not to feel the urge to limber up and stretch ourselves that little bit more. To succeed in business, it’s important to drive sales, and stretch goals have long been used as a way of doing this. A stretch goal isn’t something which can be achieved by implementing incremental changes however, as it requires pushing people to their limit – and then asking them to go beyond it. Described as being “difficult, but achievable with some extra effort,” stretch goals are often highly valuable to a workforce. Indeed, in 2012, a Forbes article described stretch goals as “essential for our health and our prosperity,” adding that they should be about human excellence, rather than financial targets. Research also suggests they can accelerate business growth and are useful for both small and large businesses. Of course, we all know that sales drive business but increasingly, many sales leaders are setting their teams unachievable targets that are more rooted in wishful thinking than market reality. The world of the stretch goal has become a more perilous place, where great sales people can suddenly be found wanting, while their weaker colleagues rake in the rewards. In theory, there isn’t anything wrong with stretch goals. In fact, research has consistently shown they boost a sales team’s morale and energise people. They help to focus sales staff and encourage innovative thinking and action, making people more persistent and passionate in their work. Indeed, when someone completes a task or is involved in something previously thought impossible, the sense of satisfaction is immense. This ultimately motivates them to take up the next challenge, no matter how difficult or unattainable it seems. As a result, companies have the potential to develop innovative services and products which might otherwise never see the light of day. And it’s all down to using stretch goals. Over the past 10 years or so however, sales leaders have ramped up their expectations when it comes to what they want their sales teams to deliver. As a result, when they fail – and they sometimes inevitably do – morale plummets, tensions rise and motivation goes out the window. We’ve mentioned already about today’s sales leaders often having unachievable stretch goals – the wishful thinking mentality. But there’s also another factor to consider if your sales team isn’t quite delivering; something that’s making those goals like waves upon the sand. The answer? Extra padding. Sales goal padding can come from all directions. You, as a sales leader, may well set an achievable and realistic stretch goal for your team. You then pass it on to a sales manager and they decide to add on an extra 5%. This new target is then passed on to the regional directors and from there it goes down to the district managers, accumulating add-ons at each level. They may be small, but they all add up in the end and when the sales team finally gets the stretch goal, it really has stretched to become something that’s far out of their capacity. What’s more – if the initial stretch goal was already unrealistic, then the issue immediately morphs into an even bigger problem. Of course, market conditions, adverse and unforeseen circumstances can also impact whether or not sales goals are achieved. If you’re setting your staff up to fail with sky-high goals from the outset however, then you shouldn’t be surprised when they fail to bring home the bacon. Wishful thinking:Your ambition overlooks current market conditions and you fail to set realistic stretch goals. Your goals don’t stretch people – they snap. Sales goal padding: The stretch goals are increased at each level of the business, so are inflated far beyond what they should be by the time they reach the sales team. Higher challenges = better sales: You might think that giving your team ever more challenging stretch goals will increase sales, but the problems come when you fail to realise when enough is enough. So, what happens when a sales team is faced with stretch goals that go beyond ‘stretching’ their abilities and are actually completely unattainable? Well, at first, they’re likely to make attempts at the work that’s been asked of them. However, Daniel Markovitz, president of Markovitz Consulting, says “stretch goals have a dangerous tendency to foster unethical behaviour” and can “result in excessive risk-taking.” The implication therefore is that, when faced with an impossible task, staff will do whatever it takes to deliver the results they need – whether it’s ethical or not – so the company’s reputation may suffer. When stretch goals have grown way out of proportion however, sales teams are often quick to realise the only outcome is failure. As a result, they lose the motivation and passion that comes with working on challenging, but realistic, stretch goals, often holding back and reducing their efforts. What’s more – as stretch goals are often given to the most talented sales staff, when they fail, the sense of dissatisfaction is even greater, which can ultimately affect employee turnover. After all – good sales staff are unlikely to stay very long with a company which asks the impossible. You may be reading all of this and thinking – I’d never over-stretch my team – but you have to be ambitious to succeed in today’s market place. Just take a moment to really think about what you ask of your sales force on a daily basis though, and how you distribute those stretch goals. Are they really as attainable as you think, or have you strayed over into wishful thinking territory? Keep records of past stretch goal results: We’re talking benchmarks here. Know what percentage of your sales team should hit their targets (research shows this is typically around 60% – 75%) and if this percentage has hit the benchmark on the last few incentive periods, then your goals are probably achievable. On the other hand, if they’ve been below benchmark many times before, then chances are they’re not going to reach it this time either. Also – a team that’s always 100% on target may need more of a challenge… Maybe your stretch goals are much too easy to reach. Look for stretch goal padding: The most effective way of doing this? Just ask. Ask the different levels of management in your organisation what they’re doing with the goals they’re given and make sure they aren’t inflating en route to the sales team on the ground. More importantly, consider collaborative goal-setting across the business to ensure padding isn’t happening formally or informally. Data analysis: Be aware of who’s working for you and how they perform. Keep an eye on the ebb and flow of staff retention in your business – who’s coming and going, and why are they doing this? If goals aren’t being met and all your high-achieving staff are leaving, then you need to know why and how this will affect your business. There’s a fine line between challenging your team and over-stretching them into failure. 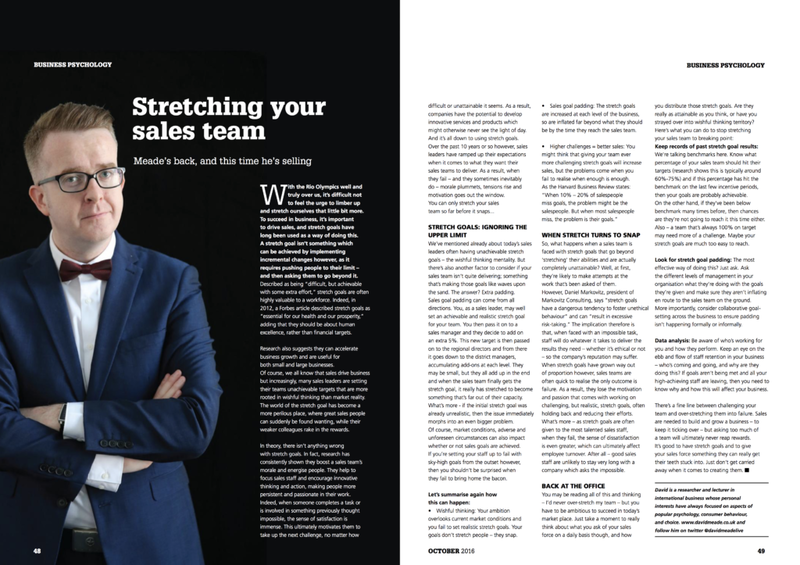 Sales are needed to build and grow a business – to keep it ticking over – but asking too much of a team will ultimately never reap rewards. It’s good to have stretch goals and to give your sales force something they can really get their teeth stuck into. Just don’t get carried away when it comes to creating them.